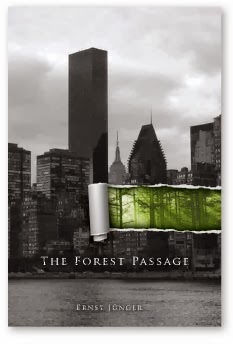 Ernst Jünger - Anarch: The Forest Passage - coming soon in English! I am thrilled to spread the news today from Telos Press that "Der Waldgang" will soon be available in English under the title "The Forest Passage"! Last year Telos also published "The Adventurous Heart: Figures and Capriccios" and are thus apparently intent on becoming the new publisher of Jünger's books in English. On behalf of all those who have been starving over the last decade for new English translations of Jünger - thank you, Telos! I have also happily received permission to help support the publication of this critical work with a few previews over the next weeks, beginning with this excerpt contrasting the Forest Rebel with the Worker and the Unknown Soldier and beginning to explain why he is determined to fight for his freedom in a technically-imposed collective slavery. "We previously referred to the Worker and the Unknown Soldier as two of the significant figures of our times. In the forest rebel we conceive a third figure, one that is emerging ever more clearly. In the Worker the active principle is deployed in an attempt to pervade and master the universe in a new manner, to reach places, near and far, which no eye has ever seen, to command forces that none have ever before unleashed. In the shadow of these actions stands the Unknown Soldier, as sacrificial victim, who shoulders the burden across vast wastelands of fire, and who, as good and unifying spirit, is invoked not only within a people but also between peoples. He is the immediate son of the earth. But, in our terms, the forest rebel is that individual who, isolated and uprooted from his homeland by the great process, sees himself finally delivered up for destruction. This could be the fate of many, indeed of all - another factor must therefore be added to the definition: this is the forest rebel’s determination to resist, and his intention to fight the battle, however hopeless. The forest rebel thus possesses a primal relationship to freedom, which, in the perspective of our times, is expressed in his intention to oppose the automatism and not to draw its ethical conclusion, which is fatalism. Considered in this manner, it becomes clear what role the forest passage plays, not merely in the thoughts but also in the reality of these years. Everyone finds themselves trapped in a predicament today, and the attempts we see to hold this coercion at bay resemble bold experiments upon which a far more significant destiny depends than that of those who have resolved to risk the experiment. A gamble of this kind can only hope to succeed if the three great powers of art, philosophy, and theology come to its aid and break fresh ground in the dead-end situation. We will explore each of these themes individually. For the moment we will only say that in art the theme of the beleaguered individual is indeed gaining ground. This naturally emerges in particular in character portrayals, and in their adaptations to the stage and cinema but above all to the novel. Indeed, the perspectives are visibly changing as depictions of an advancing or disintegrating society are replaced by the individual’s conflict with the technical collective and its world. In penetrating the depths of this world, the author himself becomes a forest rebel - because authorship is really only another name for independence." "The locus of freedom is to be found elsewhere than in mere opposition, also nowhere that any flight can lead to. We have called it the forest. There, other instruments exist than a nay scribbled in its prescribed circle. Of course, we have also seen that in the state to which things have now advanced perhaps only one in a hundred is capable of a forest passage. But numerical ratios are irrelevant here - in a theater blaze it takes one clear head, a single brave heart, to check the panic of a thousand others who succumb to an animalistic fear and threaten to crush each other. In speaking of the individual here, we mean the human being, but without the overtones that have accrued to the word over the past two centuries. We mean the free human being, as God created him. This person is not an exception, he represents no elite. Far more, he is concealed in each of us, and differences only arise from the varying degrees that individuals are able to effectuate the freedom that has been bestowed on them. In this he needs help – the help of thinkers, knowers, friends, lovers. We might also say that man sleeps in the forest - and the moment he awakens to recognize his own power, order is restored. The higher rhythm present in history as a whole may even be interpreted as man’s periodic rediscovery of himself. In all epochs there will be powers that seek to force a mask on him, at times totemic powers, at times magical or technical ones. Rigidity then increases, and with it fear. The arts petrify, dogma becomes absolute. Yet, since time immemorial, the spectacle also repeats of man removing the mask, and the happiness that follows is a reflection of the light of freedom. Under the spell of powerful optical illusions we have become accustomed to viewing man as a grain of sand next to his machines and apparatuses. But the apparatuses are, and will always be, no more than a stage set for a low-grade imagination. As man has constructed them, so he can break them down or integrate them into new orders of meaning. The chains of technology can be broken - and it is the individual that has this power." That's wonderful, thank you! Lovely news for the end of the week. Thanks for spreading the news! Jünger specifically refers to the Forest Passage as being suitable for the Russian predicament. This is probably as true now as it was when he made the comment - and not only for Russia. Good news indeed. Is there an expected publication date? Some time in December - I'll certainly announce it as soon I get news.